My Groco's raw water strainer basket fell victim to galvanic / electrolytic corrosion or maybe the thin metal screen simply wore out during the last 15 years. The basket is inserted in the hole shown below. It's ingenious in a simple sort of way: the incoming water flows into the basket in which debris is trapped and prevented from reaching the lower outflow hole. This is Jakatar's only underwater thru-hull. Seawater is filtered by the Groco and then flows into a stainless steel distribution tank. I'm using only 2 outlets from the tank - one for the engine cooling and the other for the Lavac toilet. I stopped using the salt water kitchen faucet a long time ago. If I ever cross another ocean, I'll hook it up again. In the meantime, I'm not too keen on washing dishes with salt water in anchorages where my neighbors are flushing their toilets. Seeing as I'm still recovering from the shock of spending 486 euros on a raw water engine pump shipped from the US, I decided I'd make my own filter basket. Also, I can't seem to find baskets for sale in Europe, and I'm not too keen on spending a fortune on shipping and import VAT/customs like I did with the water pump. So I spent nearly an hour enthusiastically making a basket from plastic mesh, white zip ties and very thin plastic-coated wire. It didn't fit. Frustrated, I took it apart, wound the plastic into a smaller diameter and shoved it into the hole, and that's that. It looks like I've reached a compromise: I'm using my free time to spend money on the boat!! Nasty corrosion on that basket! 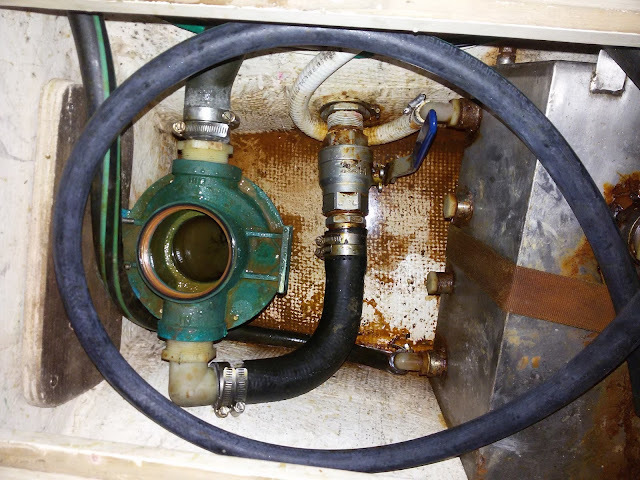 I always liked the concept of having salt water strainer but no-one has one in these waters and most say they are just a hassle... so it's really low on my list. And I luv the idea of having only one underwater thru hull. But holly cow, why did the raw water pump cost so much?!? I need a new one too but now I'm scared! I'd love to spend more money on my boat but.... I haven't been paid for a few months (again) and ....yikes!!!! 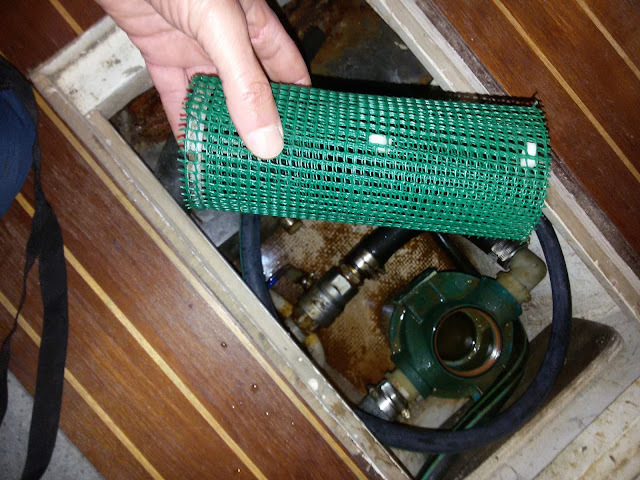 You're sort of right about not needing a strainer - "sort of" because when I dive in to clean the thru-hull (the grate type), broken pieces of shells will get sucked in and I need something to keep them out of the impeller, although I think they would fall to the bottom of the basket container even without the strainer. The pump cost so much because it went something like this: $266 for pump + $127 for UPS shipping + €118 customs + €9 credit card fees. So you see I paid 486 euros for a part that probably cost 20 euros to build. That's how life is today. If you can get parts in the EU, you'll be in luck. Bad news about your salary, at least I'm getting paid for my work...even though I'm making half of what I used to make.